Phyn & Aero, Little Red Riding Hood Nancy Ann, P17NADD11. 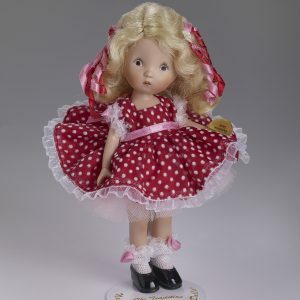 Sculpted by doll artist Dianna Effner, Little Red Riding Hood is made of the finest all bisque porcelain and stands a full six inches tall. Her delicate features are all hand painted with a delicate hand. 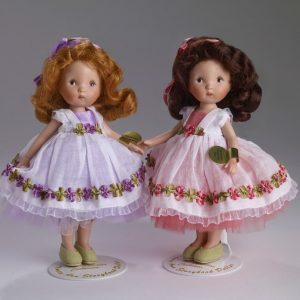 She has a tiny little mouth with the cutest pout, rosy cheeks and dark brown eyes, Her vintage inspired wig is made of auburn saran and is cut in a bob right to the bottom of her cheek. Her black hair bow keeps her hair neat and in place—she thinks it’s just the right look when she visits Grandmother. With much thought, the little cutie dons a creamy white blouse and a delightful dotted black skirt printed with bright sprays of flowers. Over the blouse, she puts a sweet little vest of leaf green faux suede that’s all tied together with a black satin ribbon. Of course, her skirt wouldn’t stand out nearly enough without a snowy white full cotton slip and for a polished look in the forest, white tights. Her little shoes are made of black faux leather in a mary-jane style. When she sets off into the woods just what would keep her warm? 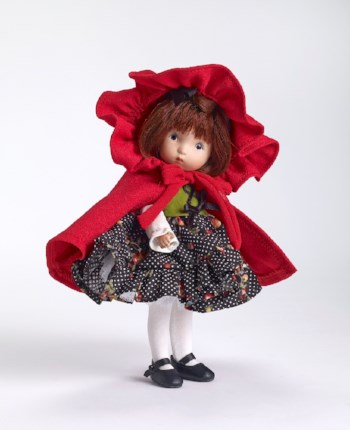 Just the thing—her favorite red cape, classic in style and with a wide ruffled hood, tied with a bow of matching red crepe. Checking herself in the mirror as she leaves home, she’s pleased with her reflection. A visit to Grandmother, through the dark woods dressed in her favorite cape—whatever could go wrong?